mundane jane: I'd like this in a size 2008, but I only want to pay the 1980 price, please. I'd like this in a size 2008, but I only want to pay the 1980 price, please. Nothing in the world will make you feel older than half an hour wandering around in an Old Navy store. I recently spent an afternoon shopping with Muffin Uptown for her birthday, and even though she's my shopping partner of choice (because when I'm with her, I get to be in charge of saying when we're through), I came away from the day with the very clear conclusion that shopping is not my bag. I'm not sure that it ever was. I just don't like letting go of my money. Unfortunately, that exchange seems to be an integral component of the shopping experience. But more than this, I'm unhappy with the selection. I have to find a way to make last year's clothes work for me until the world's designers come to their senses. The last time these clothes were in fashion, I was 17 years old and could have worn anything and gotten away with it. I frequently did. The peasant blouse? Wore it. Ruffled granny skirts that dragged the ground and were horribly stained two hours after leaving the house? Damn near burned up in them. The halter dress? Stopped traffic in it. But, come on. That ship has sailed. Away. I know, I know--designers have always loved revisiting the passé. That's how we all ended up under shoulder pads (from the 40s) all through the 1980s, and the reason I wear a pair of bell-bottomed jeans (ala 1975) on those days when jeans are deemed appropriate. And I can go along in order to get along, up to a point. But I will not wear a damned puffed sleeve. Do you hear me? I'm not doing it. 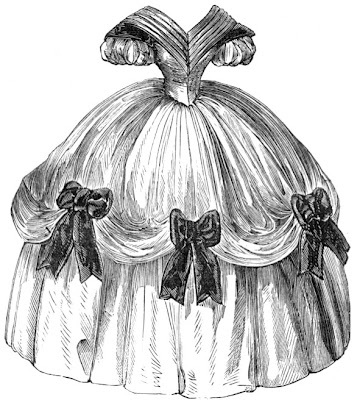 Image, Godey's Lady's Book, October 1859 via Vintage Victorian. Puffed sleeve on a smock top. They were ugly in 1980 and they're uglier now. I haven't gotten over my nightmares of wearing them in high school.